[00:51:11] <andypugh> I can’t decide if it makes it more or less likely that people will find what they want. That page of HAL components is liable to make people think that what they want isn’t there. [00:52:41] <seb_kuzminsky> has it been superceeded by bldc? [01:32:20] <KimK> So I was wondering what it might take to do memory debugging on CL, and do format verification on the .clp files, and whatever else sounds like it might be good. [01:34:09] <KimK> Suggestions and advice appreciated. Thanks in advance. I'll be nearby, getting something to eat. [01:38:00] <mozmck> As far as doc locations, manpages are really only good for more advanced linux users I would say. [03:04:11] <seb_kuzminsky> is it reproducible? [03:56:30] <seb_kuzminsky> thanks dgarr ! [04:27:02] <seb_kuzminsky> no branching in gcode? no rigid tapping? no home-to-index? backlash compensation? buggy tool compensation? [04:30:02] <skunkworks> he was a mach guy.. but does have a tormach lathe now. [04:30:26] <skunkworks> but yes - a good percentage of those things linuxcnc can do perfectly..
[04:32:25] <cradek> > I will say that while Mach3 on my mill has had a number of bugs off and on, LinuxCNC on my Tormach Lathe has been solid so far. The Tormach guys really gave it a wringing out. [04:32:25] <skunkworks> and dripfeeding is an advantage... just odd. [04:41:17] <skunkworks> and that is only because I was holding a 1/2 tap in a drill chuck..
[04:55:30] <KimK> I just looked at the guy's 10-point article. On #10 (drip feeding), that's been unnecessary for a long time, but his point about trying to insure correct gcode (from a central source?) is valid, and reminds me of a feature I'd like to see. [04:55:30] <KimK> When enabled (in the ini file?) 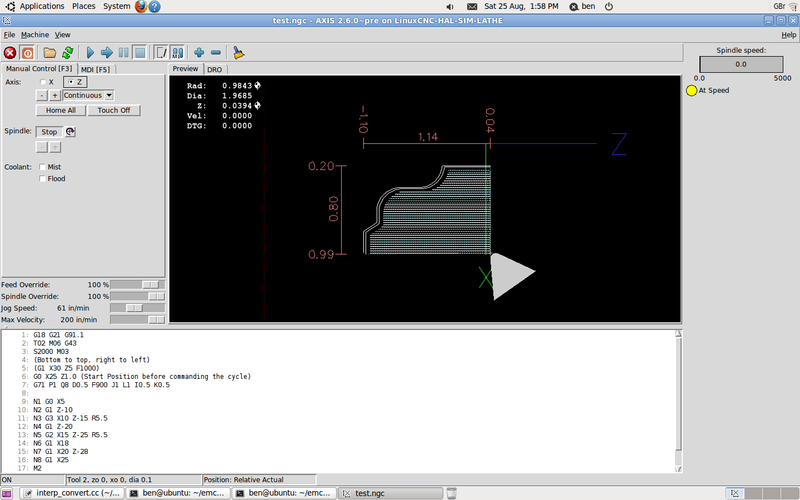 linuxcnc (what, axis? not sure.) would load from a local git repo (fed from the "programming office"). If the operator wanted to make changes in the gcode for whatever reason (programmers assumptions were in error, had to use a different vice/tool/fixture, whatever) the operator *can* make changes in the gcode, but he must git commit and say what he did and why. [04:57:34] <KimK> There would have to be a "save changes" button, of course, the operator doesn't need to know how git works. [04:59:11] <KimK> Just an idea. [05:29:18] <KimK> Hi Seb, I'll keep the article open, I'll look forward to seeing your comments. I assume you're delivering more of your "...delicate, precise kind of smacking..."? [05:29:52] <KimK> Or maybe that's just for kernel building? [05:45:18] <kwallace> When I worked in a real machine shop, the operator set up the tool changer and work holding, loaded the program, did a quick check, pushed GO, then deburred parts for the rest of the run. [05:46:01] <KimK> Yes, this is generally true, but sometimes the operators have to make last minute changes, and that's fine, but some may a want a record kept of the changes. Maybe an exotic material work-hardens more/less than the programmers thought, and the operator has to make lots of feed/speed changes for different cuts. [05:46:40] <KimK> kwallace: Hi Kirk! Yes, that's the way it's *supposed* to work, lol. But sometimes it doesn't. [05:47:33] <KimK> Nice to have some kind of record of what was done too, as far as ISO9000, and other paperwork baloney. [05:48:29] <kwallace> In the shop I worked at, the job would go back to the CAM room, to be fixed. [05:49:12] <KimK> If it's contouring (often the case), then the feed and speed is set at the beginning of some sub-operation. [05:50:05] <KimK> Anyway, it's an idea, and git seems made for it. [06:05:50] <kwallace> I suppose real shops have some sort of version control somewhere in the work flow. It used to be in the corner of the velum. [06:09:02] <kwallace> That was back when CNC operators wore white lab coats. [06:20:19] <kwallace> I wonder if Git could be used in the background with a controller's file utility? [06:22:54] <kwallace> It would need to be tied in with anything that could change a file, so sounds more like the controller should be a slave to a file server. [06:26:45] <kwallace> Along with the tool manager and material acquisition system. Damn, my glass is empty. [10:30:15] <andypugh> Bob’s article claims benefits for drip-feed that can equally well be achieved by keeping the programs on a networked drive, which is pretty easy with both LinuxCNC and Mach. [11:21:06] <skunkworks> although with mach - your not supposed to use network because it could cause problems with the printer port. Maybe it is better with motion control cards. [15:16:54] <seb_kuzminsky> it's still "awaiting moderation"
[16:53:16] <KimK> skunkworks: I don't see the price of "SandyBox", do you know? [16:53:35] <skunkworks> no.. they posted it on the machinekit list. [16:54:24] <KimK> Just curious what they're getting for the thing. [17:01:43] <skunkworks> I would assume that is what it is..
[17:03:27] <andypugh> I don’t think that they are claiming anything else of it. However it is interesting that it seems to be doing some sort of remote X-session over USB. [17:04:39] <skunkworks> right - untill the rest of the machinetalk gets worked out.. Then they should be able to connect to it using socket or whatever it is called. [17:05:27] <pcw_home> Wonder why they chose USB? [17:05:52] <skunkworks> I think alex_joni had a system setup using linuxcnc in a similar way. [17:07:04] <skunkworks> iirc he had done some work with them..
[17:17:38] <skunkworks> do you constanly have the louie louie song in your head? [17:27:42] <bjmorel_work> seb_kuzminsky: Very well written comment. [17:28:32] <bjmorel_work> seb_kuzminsky: Did you put ballscrews in your Bridgeport? [17:31:34] <cradek> > The tool compensation feature includes support for multiple simultaneous offsets, typically used for nominal tool diameter and wear compensation. [17:32:11] <seb_kuzminsky> isnt that what g43.2 does? [17:38:50] <andypugh> http://youtu.be/cm2gZh5k4F0 : How to fiddle the machine parameters to make your point. [17:39:55] <andypugh> Bob did subscribe to the forums a year or more ago. (I saw the name go past). [17:54:52] <bjmorel_work> I was quoting a customer a ball screw assembly this morning & noticed that Rockford has ball screw kits for Bridgeport & clones. [17:58:50] <skunkworks> eh - I think andy is right - crappy machine setup. [19:44:32] <skunkworks> seb_kuzminsky, bob replied..
[20:20:52] <PCW> Is their modern SCSI hardware? [20:42:05] <andypugh> GPIB is upstairs. [20:47:16] <PCW> yeah most use "integrated magnetics"
[20:47:47] <MarkusBec> hacking fw vor a gbic optical fiber transiver? [20:54:12] <PCW> didn't look like this did it? [21:06:04] <kwallace> Tormach has released their LinuxCNC version only for the lathe so Bob W's comments may need to be considered in that context. Also I think Tormach LinuxCNC is based on 2.6.4/10.04 with a lot of Tormach changes from there. [21:13:15] <kwallace> seb_kuzminsky, Yes, but the powers that be are using the "if asked for" clause. It's not that they want to withhold anything, but dealing with competitors doing a wholesale rip-off hasn't been addressed yet. [21:17:47] <kwallace> Well... at that time they didn't want to have unrefined code that could be attributed to Tormach going out. It's probably not an issue not that the lathe is released, but only just. [21:21:20] <KimK> On the (earlier) subject of demo videos, I forgot to say that this is one of my favorite "linuxcnc got it right" motion-sync videos (not strictly rigid tapping, actually lathe threading, but very similar). He's not cutting new threads here, but using a previously-cut thread to show the re-threading (he slightly repositions the workpiece early on). [21:21:41] <KimK> It's my favorite for two reasons: (1) he mounted the camera on the tool, so motion sync is clearly visible when it occurs (it's a large workpiece), and (2), he turns the first pass or two by hand, spindle in neutral, and the tool stops/slows exactly when he does, showing that it's not RPM-dependent and that it's not "guessing" where the spindle is "estimated" to be. [21:21:48] <seb_kuzminsky> kwallace: what is the "if asked for" clause? [21:23:40] <seb_kuzminsky> do you mean section 3.b? [21:27:26] <andypugh> There has been a suggestion on the Forum that my lathe macro config should be one of the demo configs. [21:31:29] <kwallace> seb_kuzminsky, I am not at all knowledgeable about GPL. I avoid these issues if possible. I can get better if I have to. [21:40:15] <PetefromTn_> KimK that is a really neat video. I remember the first time I saw Andypugh's similar video showing synchronized motion on his 3 in 1 machine setup. Really cool. [21:51:20] <KimK> PetefromTn_: Yes, Andy's excellent motion-synchronized gear hobbing video also deserves mention, but in this specific case (the 10-point article), the significance of gear hobbing might be lost on the average Mach user who is having trouble rigid-tapping (or threading) and looking for alternatives. [21:56:55] <KimK> I didn't notice that, I'll look at it again. He may have been fiddling with the engage lever? [22:00:52] <andypugh> In CSS mode the spindle will speed up when the tool retracts. [22:00:52] <jepler> kwallace: you should probably read up on the GPL. When someone ships GPL software, particularly in binary form as part of a business model, it's very important to comply with the GPL. Noncompliance terminates your GPL rights including the rights to distribute the software. [22:02:14] <kwallace> Yes, I understand that, now may be the time to start working in that direction. [22:04:56] <kwallace> I glanced through GPL2 and got the feeling that I can weed out any files that are not derived from LinuxCNC proper. [22:04:59] <jepler> and fwiw even though the GPLv2's requirement is to distribute the software on media for a fee, a company which doesn't also offer the software for download without fee is seriously out of step with the norms of Free Software. [22:05:18] <jepler> I don't understand what you mean when you say "weed out"
[22:16:03] <kwallace> We (but I'm not a legal we) have a body of files of which LinuxCNC is a part of. It seems prudent to only provide work that satisfies the license. Once that is out of the way we can go from there. [22:17:18] <jepler> in the GPL the relevant term is 'a "work based on the Program" [meaning] either the Program or any derivative work under copyright law"
[22:27:21] <kwallace> I need to take some time to get a handle on this. If there are conflicts, does LinuxCNC have an official person to deal with? [22:30:23] <cradek> in the past we've had good luck asking a fsf lawyer for help/advice. but nothing that I see so far shows that your situation is complicated in any way - you can read the license and figure out what you need to do. I'm not sure what you would want from any/one of us. [22:31:32] <cradek> and the text of the gpl2 is really quite short and easy to understand. it's only a few paragraphs. [23:39:28] <memfrob> It's really annoying when the xenomai and RTAI devs copy all my work and never credit me..
[23:40:54] <memfrob> Whenever I bump IPIPE they just push my patch in, no mention of me whatsoever. [23:48:58] <PCW> Not one of the righteous? [23:50:53] <memfrob> 3 days ago I bumped IPIPE to 3.14 then this dumbass, Jan, over at xenomai does the same thing, I expect this kind of crap from Paolo, not the xen team. [23:52:46] <memfrob> six hours ago when he committed that patch, he could have done his own 3.14.27 at least to be different, but nope.